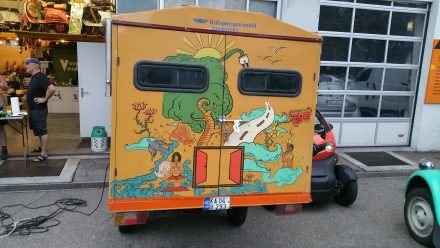 For some time now, I’ve been following a very interesting project: Tejas, the Solar Tuk Tuk. 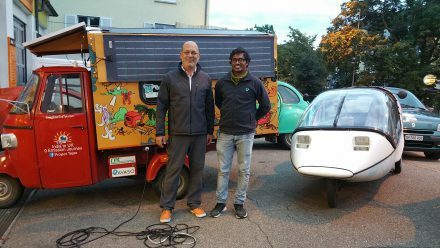 Naveen Rabelli is driving his DYI-conversion of an Ape three-wheeler on a 10’000km trip from India to England. On his trip he is proving that very simple sustainable technology can be as reliable as mass-produced conventional technology and at the same time connecting people involved in sustainable technologies. Switzerland wasn’t on Naveen’s route originally. I was extremely happy when I was unexpectedly added to a chat-group on a popular mobile chat platform supporting his trip from southern Germany to France via Switzerland. I was subsequently invited to Naveen’s stop-over in Zürich, where I was keen to learn about his trip and how this extreme long-distance trip had been for him. Arriving at the venue, I wasn’t too surprised to find an interesting mix of electric cars and conversions parked around the Solar Tuk Tuk. Naveen, by now used to all the questions, eloquently and exhaustively explained all the Tuk Tuk’s features and technical specs. 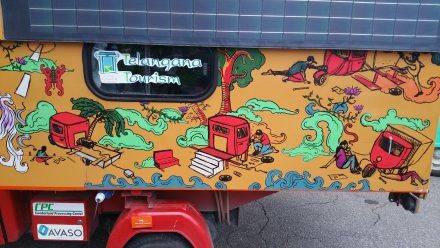 The Solar Tuk Tuk can charge solar-only (which it had to during the trip) but mostly charges using one phase at 10/16A. 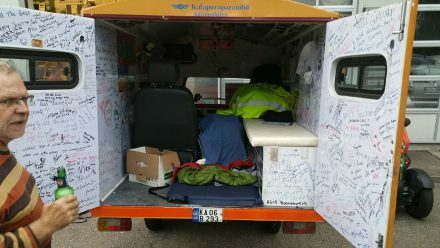 If there isn’t anyone close that can accommodate him, the Tuk Tuk has ample space for him to sleep in the back. Another surprise was seeing Walti and Annemarie Haus who were part of WAVE2011, TW560’s epic trip to India. Everyone posed for a picture with Naveen. Asking about his motivation, he told me that on one hand it was proving that it could be done, but on the other it was when we visited Reva in India and saw that it was being done. This was one of the things we were aiming for during our trip across India 5 years ago: motivating others to do extraordinary things – god-speed, Naveen, god-speed & good luck! Looking forward to meeting you in London!